The donut cart that resides in front of Sleeping Beauty’s Castle at Disneyland is known for its incredible donut creations — and two new donuts are ready-made to celebrate the royal mouse couple. Valentine’s Day Dinner Menu at Walt Disney World’s Yachtsman Steakhouse! 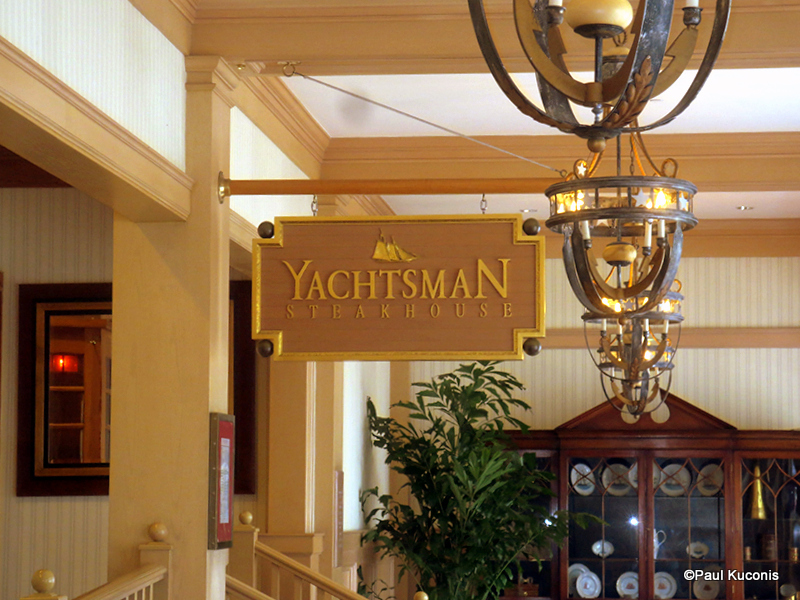 If you’re looking for a spot to enjoy a romantic (or, you know, just delicious) dinner at Walt Disney World on Valentine’s Day, Yachtsman Steakhouse has a special three-course menu made just for you. Diners choosing the three-course option (the full a la carte menu is still available as well!) will select from Caesar Salad or Charred Octopus to start, followed by Chateaubriand for Two, and ending with a White and Dark Chocolate Mousse Sphere. The Flurry of Fun at Walt Disney World’s Disney’s Hollywood Studios might as well be called Flurry of Deliciousness because with the holiday festivities also came a ton of exciting holiday treats! 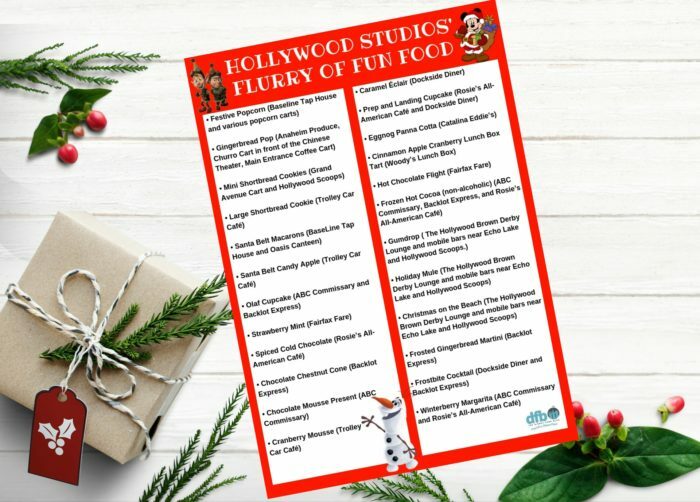 Believe it or not, there are so many fantastic eats and drinks that we created the DFB’s exclusive Flurry of Fun Food Checklist. But now we need to break it down. Because if you’re trying to eat your way through the Disney Parks this year, you’ll have to roll yourself home. (Trust us, we know.) And that’s why you’ve got us! We try it all (see ALL of our Flurry of Fun Reviews Here!) — so we can help you find the BEST of Hollywood Studios’ Flurry of Fun! This is one Flurry of Fun treat that you don’t want to miss if you’re an egg nog fan — and believe us when we say that it was a bit of a surprise! Panna Cotta that’s not done well tends to give us milk jello vibes, and that’s not a good thing. But the Egg Nog Panna Cotta from Catalina Eddie’s was a good example of panna cotta done right. The panna cotta itself is creamy and really carries that egg nog flavor. The tart raspberries are a phenomenal counterpart, and we also loved the bits of cranberry on top. It’s a dessert that’s both comfortable and classy. Get this! We’re celebrating 90 years with Mickey Mouse at the parks of Walt Disney World this weekend, and what that means is lots, and lots, and lots of cake! 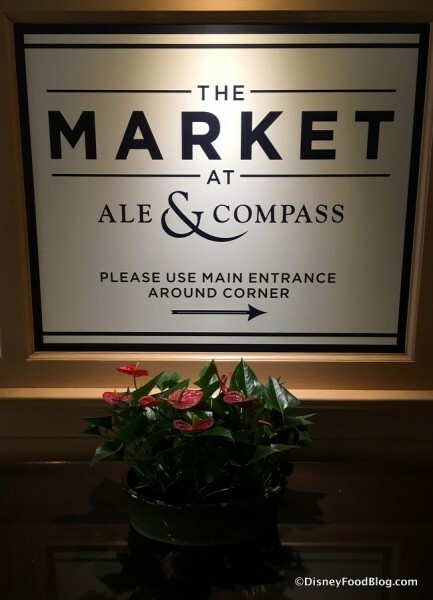 Animal Kingdom Lodge’s quick service spot The Mara (home of our beloved Peanut Butter Brownie) is joining the party is a Happy Birthday Mickey Gateau that is way more than just a cake. Can’t get enough Mickey-shaped treats this Halloween season? 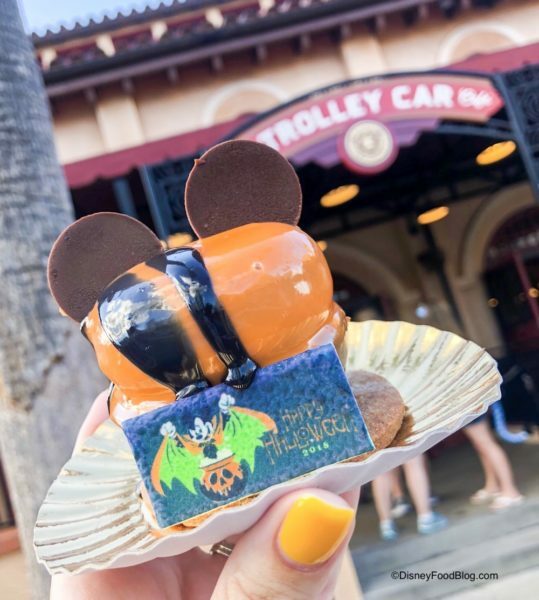 We brought you the scoop on festive fall treats available in Walt Disney World, and now we’re coming at ya with a review on this spooky, sweet treat from Trolley Car Cafe in Disney’s Hollywood Studios. Need to know more about this pumpkin-inspired dessert? We’ve got you covered. 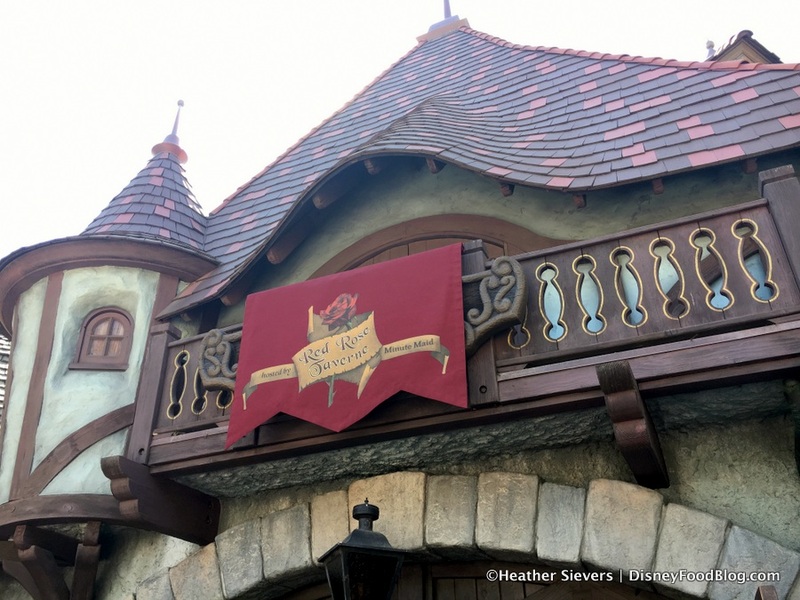 You might recall when Disneyland Resort’s Village Haus was shrouded in Beauty and the Beast details and renamed Red Rose Taverne, but what might surprise you is that the shroud remains intact! Red Rose Taverne is still very much a part of the park’s Fantasyland, and — as such — it’s also getting in the Halloween Time spirit! 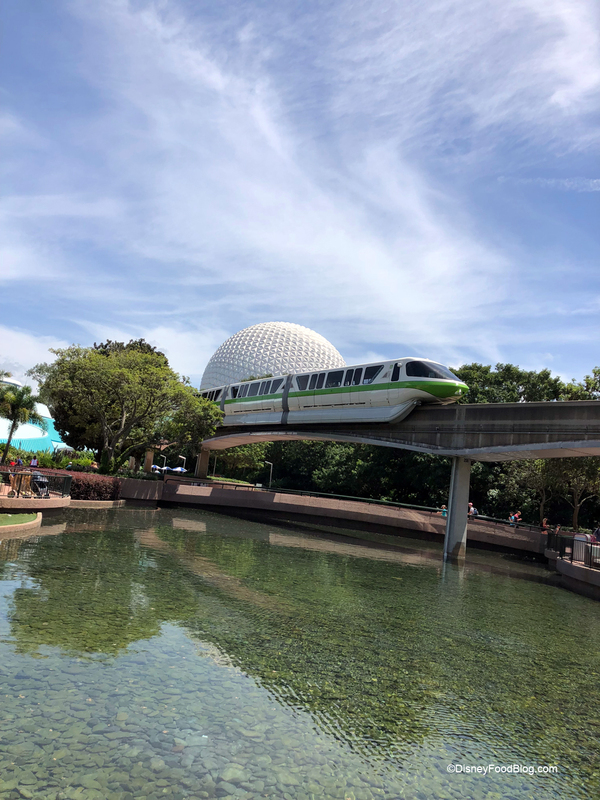 We had a case of wanderlust this week, and instead of getting out the passport and packing, we just hopped over to spend the day in Epcot. Our journey started with some time spent in Future World, followed by a trip around the World Showcase. And boy, did we find a lot new eats and buys for you on this “trip”! We are stopping into Amorette’s Patisserie today to see what’s new! The high-end pastry shop has showcased classy pastries from the beginning. 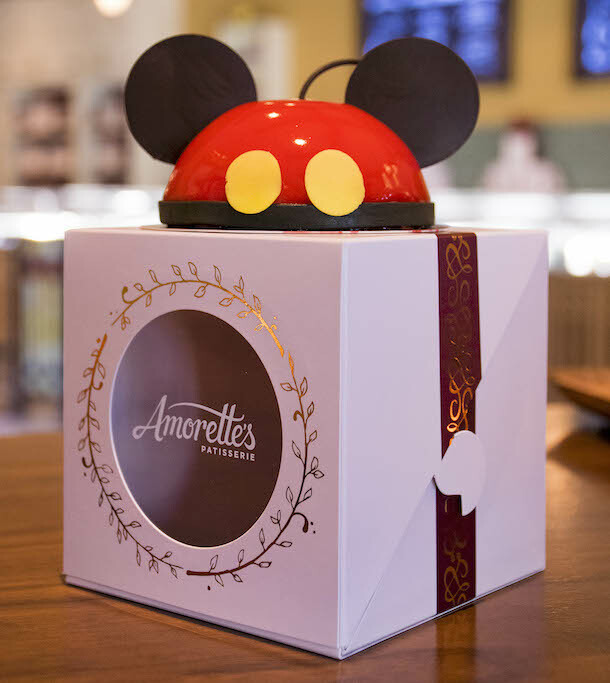 Combining classic flavors with new and creating some of the most beautiful sugary confections we’ve ever seen, Amorette’s has been an interesting addition to Disney Springs. Why “interesting?” Well, the DFB team is split on whether or not we love this place. Some of us think it’s great; others aren’t impressed. While the eats are extraordinarily beautiful, I, personally, am not necessarily sure that they’re worth the extraordinarily high price tag. 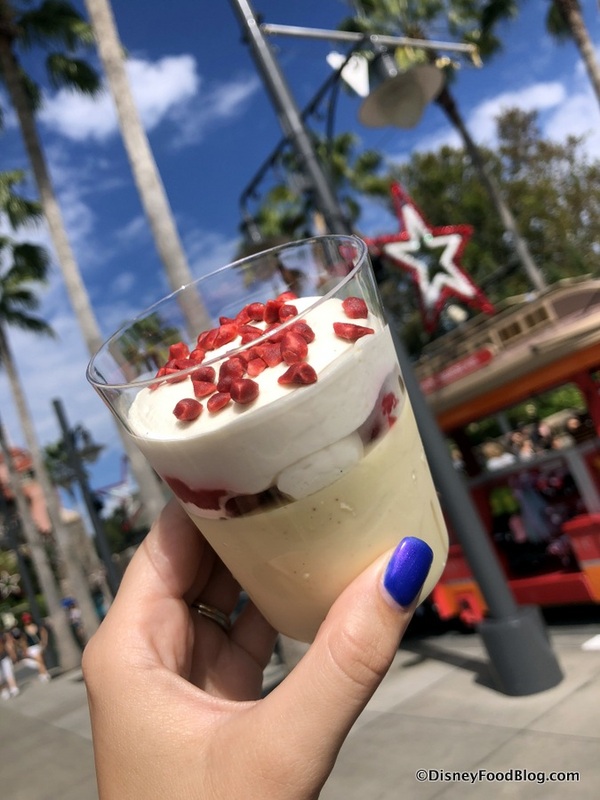 But on a recent visit we simply had to try out the brand new — and gorgeous — Mickey mousse, introduced in honor of Mickey Mouse’s birthday, and the holiday Snowball. 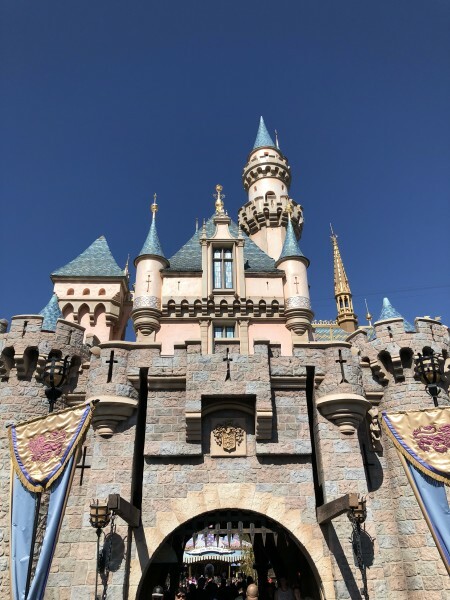 When Mickey Mouse celebrated his most recent birthday, some pretty awesome treats debuted in Disneyland and Walt Disney World. But this Petit Mickey Domed Cake at Amorette’s was a showstopper. Originally the cake was reported to feature Chocolate Chiffon Cake, Milk Chocolate Mousse, and Orange Blossom Pâte de Fruit. 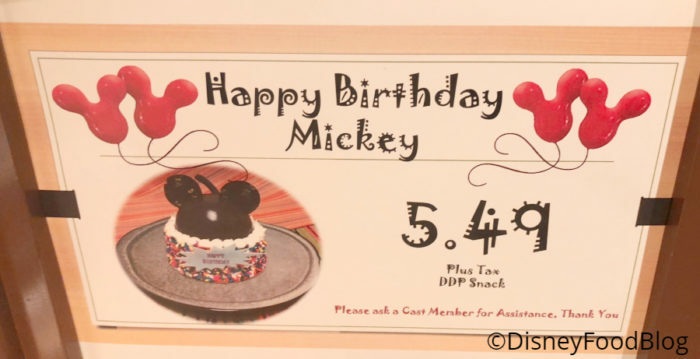 I was a bit afraid that the sweet little treat would disappear soon, since it was a special offering for Mickey’s special day. But the cast members told us that the cake is here to stay! The Disneyland Resort has gone all out for Disneyland’s Diamond Celebration. Special decor, special merchandise, and most importantly, special food! 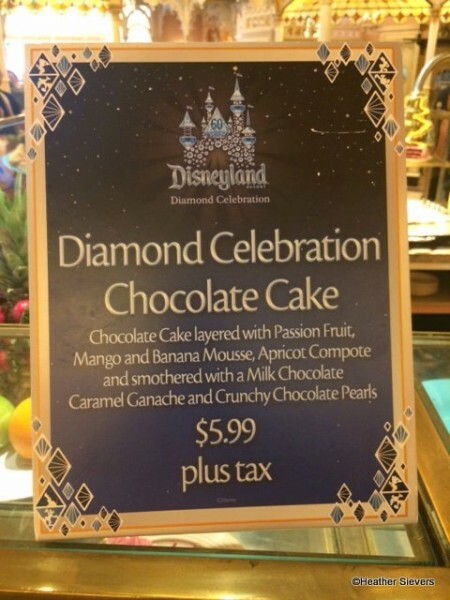 On a recent visit to Plaza Inn, I noticed an intriguing dessert that I had to try, Diamond Celebration Chocolate Cake. Honestly, I bought this out of curiosity because it sounded like a bizarre mix of flavors to me.